Overview – This is not currently an active issue for our Sierra Club Group but may be of interest as past involvement. 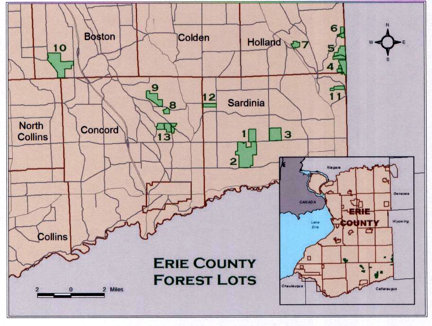 The fate of the Erie County Forest is still up in the air. In 2006 Sierra and ADK succeeded in persuading the Erie County Legislature to order a halt to the destructive logging that had been started there. Before the halt a large number of valuable, old oak, maple and black cherry trees were taken down. Legislator Tom Loughran was willing to introduce legislation directed to designate the Forest as Parkland. Chris Collins and the recession came along and our campaign ran out of steam. The issue remains a high priority. It is still a wonderful forest. Go there and have a ball then come back and help us keep it that way. Sierra Club has cooperated with The Adirondack Mountain Club, Foothills Trail Club, Buffalo Audubon and several interested individuals in a loose coalition called Friends of the Erie County Forest. We have attended public meetings, reviewed the Counties plan on the internet, and hiked the forest repeatedly, alone and in the company of forestry experts, reporters and legislators. We have talked with those consultants involved in the planning and with contractors doing the logging. We photographed the Forest and publicized the damage being done by internet and by writing about it for the Buffalo News. We met with the Editorial Board of the Buffalo News and with News reporters. 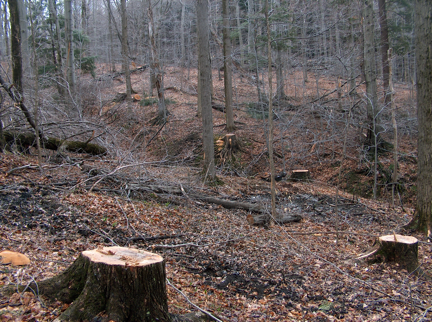 Here is an article published in the Buffalo News on how the Parks Department misled the public on logging in the Forest. Representatives from the Niagara Group testified twice before the Erie County Legislator. Many members of our organizations made phone calls to their district legislators and wrote letters to Everybody’s Column. We persuaded Assemblyman Sam Hoyt to write to the Legislature on the subject. We informed Kathleen Balus, newly elected Sardinia Supervisor, and she spoke before the Legislature. We provided the Legislature with legal advice regarding the operation of the SEQRA law. The Legislature responded by calling a halt to the logging and is considering our recommendation to make the Forest a Park. Animal habitat, soil and water conservation, CO2 sequestration, education, recreation and as an example to private land holders how to manage land. The Conservation Trail passes through it, connecting Canada’s Bruce Trail with the United States’ North Country Trail. It is a favorite of local hiking, skiing and snowmobile clubs. It is worth much more to the people of Erie County for these uses than for the cash from the sale of its timber but what ever use it is put to, it needs a plan for that use. Only in the last several months has its timber been harvested. A draft management plan was publicized by the Erie County Department of Parks in spring, 2004 and but was taken down from its internet site. Some Forest information remains at: http://www.erie.gov/parks/forestry.asp. The Parks Commissioner stated its objective to be for the health of the forest, for recreation and education and, lastly if at all, for revenue. It contained a preliminary survey of the Forest resources and two conflicting sets of recommendations as to their management, one by Earth Spirit and the other by the N.Y. Department of Environmental Conservation. It had no provision to control erosion or water pollution. It was presented to the public as a draft to be completed after public input. Earth Spirit is a nature education organization that was a tenant of the County and occupied former 4H buildings on Erie County Forest property as it worked on this plan. 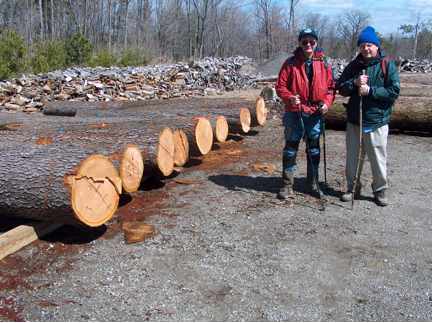 In April 2004, Sierra, The Adirondack Mountain Club, Foothills Trail Club, and Buffalo Audubon reviewed the plan with the assistance of Foresters Bruce Kershner and Franz Sieschab. These organizations condemned the plan for its prescribing primarily timber extraction and its disregard for other values, for its use of clear cutting, herbicides and its lack of erosion control. In response, the Parks Department agreed to rework their plan including putting half of the forest into nature preserve. But the County went into a financial crunch and nothing happened. Then, with no further planning, in the winter of 2006 the Parks Department had contractors begin timbering Lots 3 and 7 of the Forest. In preparation for this, the Parks Department made a declaration under SEQRA (the NY State Environmental Review Act) that no important detrimental environmental impact would result from their action which they said would consist of taking only blowdown in the interest of the health of the Forest. Instead they removed only large 180-200 year-old maple, ash and cherry. In both Lots 3 and 7, both DEC and Earth Spirit recommendations were ignored. They had said that because of its rich ecological resources LOT 3 should be left alone (with the exception of its blown-down monoculture.) The loggers did not avoid steep slopes or leave stream buffers. They cut Lot 3 heavily, taking only the large old trees. When we brought this to light, the Erie County Legislature under Environment and Energy Chair Tom Loughran ended the logging. 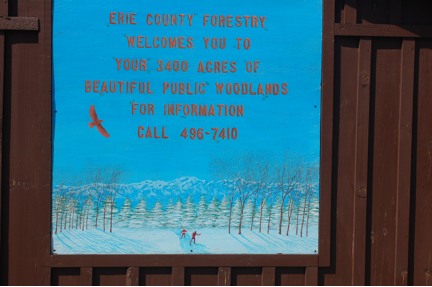 A forestry objective and a forestry plan to accomplish that objective are necessary if the Erie County Forest is to be managed in the best interests of the people of the County. A plan is needed for our Erie County Forest. The Forest is valuable for education, recreation and as nature preserve as well as for having commercial value as timber. All of these values would rapidly decline if logging of the Forest were continued in the fashion begun in 2006. The needed plan must have SEQRA review, with SEQRA public input and it must be done by a credentialed forest ecologist or forester. The most valuable plan objective for the Erie County Forest is to continue with the passive uses it has been put to since 1927. Let’s make it a Park. Erie County Legislator Tom Loughran has promised to introduce a law to make the Erie County Forest a Park. We are working to supply him with the text for that law. We need to work with the other Legislator’s to prepare the ground for its passage. Call your county legislator and let your views on the future of the forest be heard.